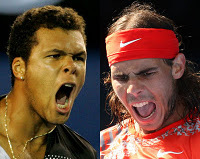 Rafeal Nadal will face Wilfred Tsonga in a Group B Round robin match of ATP World Tour Finals Thursday. Although, both of have won and ost one game each, 1, and lost 1 game, in aggregate Tsonga is leading ahead. It's "DO OR DIE" situation for both as loss in this match may result in elimination. Nadal, who was the finalist at O2 Arena will have to work hard, to get pass this test.